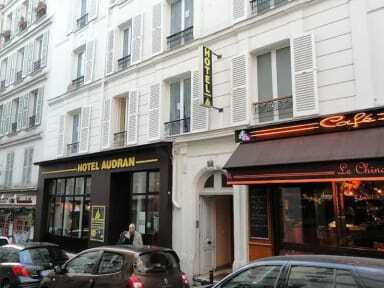 The Audran is a friendly 2-star hotel ideally located in the heart of Montmartre one of the oldest districts in Paris. The hotel offers a continental breakfast complete with hot drinks and fresh juices. Other facilities at Audran include a 24-hour front desk, a lift and luggage storage is also available. The property is located at only just 200 m from Abbesses metro station. The Audran is ideally located for those who want to relax in Paris. The famous Moulin Rouge is just 400 m from the hotel and guests can walk to the Sacré Coeur in 5 minutes. Local transport links lead directly to Place de la Concorde and the chic Madeleine area. The 18th arrondissement is a great choice for travellers interested in sightseeing. The rooms are comfortable, simply furnished and decorated. The simply decorated rooms at Audran offer a TV, safe and private bathroom. Some rooms have views of the inner courtyard or the lively street filled with restaurants and bars. All rooms have a private bathroom. Payment types accepted at this property: cash, credit card and debit card (Amex, Visa, Mastercard, Wester Union accepted). All children under 16 years are charged 5 euros per night for extra beds. Any additional older children or adults are charged 5 euros per night for extra beds. Additional fees are not calculated automatically in the total cost.